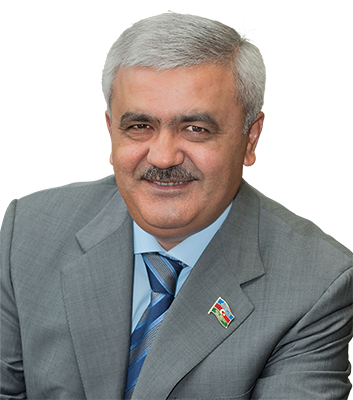 Rovnag Ibrahim oglu Abdullayev was born on April 3, 1965 in Nakhchivan City, Azerbaijan. After graduating from secondary school in 1982 he entered Azerbaijan Civil Engineering Institute, of Industrial and Civil Engineering Faculty. From 1983 until 1985 he did military service. In 1985 he was transferred to Kuibyshev Moscow Civil Engineering Institute. After graduation in 1989 he began his labor activity in “Neft Dashlari”. From 1990 until 1991 he worked as an engineer for the Works and Building Division of “28 May Offshore Oil & Gas Production Department”. From 1991 until 1994 he was head of the Industrial Engineering Division of Construction and Mounting Department Number Three of “Xazardenizneftgazinshaat” Trust. In 1994 he became a chief engineer of Construction and Mounting Department Number Three and in 1997, a manager of “Xazardenizneftgazinshaat” Trust. On March 31, 2003 he was appointed director of the Heydar Aliyev Baku Oil Refinery. On November 6, 2005 by the third convocation he was elected as a member to the National Parliament of the Republic of Azerbaijan. On December 9, 2005 he was appointed as President of the State Oil Company of Azerbaijan. Aside from that he is president of the “Association of Football Federations of Azerbaijan” (AFFA). © 2009 – 2019 Copyright by SOCAR Representative Office Germany. All rights reserved.